With increasing numbers of men staying at home to take care of the house while their more qualified wives assume professional positions in the workplace, there is an increasing need to train men to properly keep house. Asking an average man to clean the living room will likely result in his spending five minutes running the vacuum and calling the job done. Women don’t see it that way; they want perfection and to get it they’re going to have to train their men. So, how to do this? Well, a woman’s mother or aunts can do some training. In my case, my wife’s mother and her aunt trained me on weekend visits to their homes. Another way is to farm your man out to a local woman-owned cleaning service; they can always use the extra help and he’ll not only learn how to clean house, but how to do it efficiently. I was trained this way when Nancy’s mother arranged for me to work for her friend Mary at her company, Mary Maids. 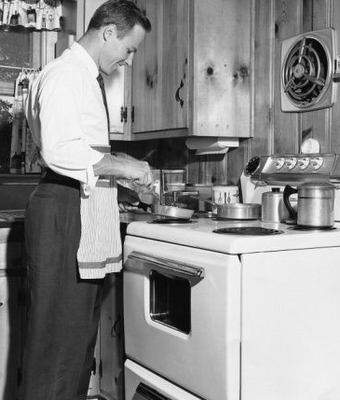 A third way is emerging—formal training in housekeeping specifically aimed at stay-at-home-husbands. And I’ve gone through this type of training, too. Yes, I’m well trained and proud of it! The women’s center where Nancy, her mother, and I volunteer has always been a local forum for advocating Matriarchy, Women’s Rights, and FLRs. Advocacy takes on many forms, and in this case it’s recognizing that men need structured training in housekeeping. This has resulted in a men-only course offered by our center, informally called Housekeeping 101. Women have been excited about Housekeeping 101 since it gives their men needed skills without the women having to be involved in the training. Men are initially hesitant but always come to enjoy the program and appreciate how it will help them please their wives. Only the serious need apply, however. Housekeeping 101 is NOT game playing; it's hard work, and to this end, the tuition is purposely expensive—$125, non-refundable. It’s strongly suggested that men pay the tuition and additional fees from their personal funds or allowances ensuring that they’ll appreciate the training all the more. Paying tuition and fees takes place before the first day of class and isn’t simply about writing a check. There is a little required ritual where men present cash to the women of the admissions committee using a pastel envelope specifically for that purpose. Tuition, paid in full, is required before the first day of class. The monies due are typically much more than a man in an FLR has access to, so he usually has to borrow from his wife. This is a good thing! In my case I borrowed from Nancy’s mother. It took me two years to pay her back, including the 30 percent interest she added to the loan. Having to ask reinforces the FLR and reminds a man who’s in charge. In addition to tuition, men are expected to make a generous donation to at least one of a suggested list women's groups. They must prove they made the donation and their donations must be judged as appropriate by the center’s board of directors. Most men elect to make a donation directly to the women’s center to support its activities. Applicants must be nominated by a woman, have demonstrated Feminist credentials, and have a demeanor that predicts success in the program. 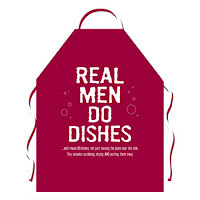 We are looking for progressive gentlemen who want to put on an apron and do housework. And we get them. The majority of men taking the course are in or aspiring to the FLR lifestyle. All applicants have to go through an application process that includes submitting a written application, writing an essay on an assigned topic, and an interview with the women’s center admission committee. Men can be rejected and no reason need be given; the $125 application fee, as I said, is not refunded. The week before class starts, a three-hour orientation is conducted during which students meet their faculty members and introduce themselves. The fee for orientation is an additional, nonrefundable $125. During orientation men meet the faculty and learn that obedience is a must—yes, Ma'am! They learn the details of the course and what is expected of them. One of the expectations is that men will carry themselves in a prim manner. We’re not talking effeminate; we’re talking formality and attitude. One of the instructors lectures the men on their attitude, explaining that they should conduct themselves as though they were serving the Queen. Well, in a way, they are! Prim and proper is the order of the day; simply doing housework isn’t enough, one must exhibit enthusiasm for the domestic tasks at hand. 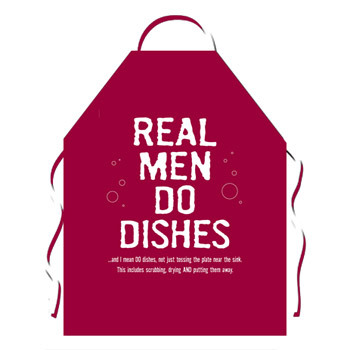 Men supply their own cleaning supplies as dictated by the faculty and MUST wear an apron. The course provides each man with a valuable reference book, including useful checklists such as the “52 Things That Add Up to a Clean Living Room,” lots of hands-on instruction, and an opportunity to put skills into practice. Classes are conducted on Saturday morning at the center and a practicum is conducted Saturday afternoon. Classes begin promptly at 7:00 a.m. with students at practicum by noon. Classes consist of lectures, demonstrations, and personal instruction. Men are expected to shut up, pay attention, and take notes. There is no talking among students. Students wanting to ask a question raise their hand and, if recognized, use appropriate protocol of, “Excuse me, Madame, but I have a question” and then proceed with the question. If it is deemed appropriate, it will be answered. The women don’t hesitate to scold a student and embarrass him in front of the others if they think it necessary—and they often do. Coursework runs the gamut of what a student will need to keep a house clean. Each week covers a specific topic—dusting, scrubbing, ironing, washing, and so on, with cooking typically taking three sessions. Recently men received a lesson in vacuuming as well as a lecture from a woman who owns a local appliance store. She demonstrated the latest in vacuum cleaners while the men oohed and aahed at the new technology. Each of the apron-clad students was called out by one by the instructors to try the vacuums on the center’s rugs. The men seemed to compete with each other as they demonstrated their proficiency with a vacuum. Each man in turn used one of the vacuums and provided his assessments to the class; all the men commented favorably about the vacuum they used. Then it was off to work, spending the rest of the morning cleaning the center before going on practicum. During the Saturday afternoon practicum, students have a visit (supervised by one of the faculty) to a host woman's home. This woman has volunteered her home to allow students to put into practice what they've learned and to gain some housekeeping experience. Upon arriving at the host woman's home, the male student introduces himself and receives any instructions she may have. The woman host is usually a friend of the instructor and the two of them can socialize while the student—or students, depending on the assignment—cleans the house. The student usually finds himself doing general house cleaning, which always includes scrubbing and bathrooms. The remainder of the afternoon will be spent on what she needs done, ironing perhaps. On leaving, students are expected to thank the host woman and provide her a gratuity in a pastel envelope with a note of thanks. A $25 gratuity is the norm. Students and faculty return to the center after practicum and receive homework assignments that the men have to complete before the next session. This can include reading, practical work, and preparation. Preparation for laundry and ironing classes means bringing clothes to be used washed and ironed. sew on buttons and they need to do it quickly; five buttons have to be affixed in three minutes; one doesn’t want to keep a woman waiting! The successful completion of the class is celebrated at a graduation dinner for attendees and spouses. Having completed the course, a man will be competent in vacuuming, washing and ironing, cleaning and dusting, maintaining a spotless kitchen, sanitizing the bathroom, and basic cooking and sewing. Women are provided with a schedule of household chores to use in putting their man on an appropriate and ongoing routine of housekeeping. I was privileged to attend the inaugural session of this course. I've attended on two other occasions, too—the last two times not as a student, but as a “sheep dog,” as the women call me. Everyone knows men are followers, not leaders, and my job is to lead the male students in doing things the women's way. My job as a male participant is to be a good example for the other men in the group and encourage them along. Believe me, if I get up and brag about my new vacuum or about how much I love to iron, the other men will soon be doing the same—oh, yes, men are easy to control and women should be controlling us! I may appear to be “one of the boys” in the class, but I'm really one of the girls in terms of my loyalties and sentiments, and in terms of wanting to bring more men into a life of service. Men doing housekeeping is step one on the way to Matriarchy! Advanced study – yes! We have a follow-on to “Housekeeping 101,””Gracious Living,” which continues with topics beyond basic housekeeping and includes window treatments, linens and tableware, correspondence and stationery, personal service, and so on. We may discuss this course in future postings. Is this class offered in Florida? My wife would sign me up in a minute and I would love to attend. We have been in a WLM for about 12 years, we are both retired so I have the time for this class. I have been doing all of the housework, ironing most meals etc. But my wife always finds some fault with what I have done, and as a result I get punished by her, sometimes severely . I would love to learn to do housework properly. She goes out golfing, plays tennis or goes to the gym when I do housework, she does not want to stand over me. She will always find something not done properly, then it is more chastity time in my CB 6000 , corner time or other punishments. This course would help me serve her better. "Please note that we’re not looking for applications for Housekeeping 101, we have more than enough applicants who have been vetted through the center. Rather, what we’d like to see is women organizing similar training in their locales for men needing to acquire such skills." Perhaps your wife might wish to take that suggestion under advisement or confer with other women in wife-led marriages in your area. You mention you volunteer at "a local forum for advocating Matriarchy, Women’s Rights, and FLRs." Please provide more info about them. What is their website. Do they accept donations? How openly FLR are the members? How does it work? Can we join? It was several months ago that I mused on this website about taking on the house cleaner's duties in our home, thinking I would do every other week (I work part time and keep house the rest of the week). Nancys' reaction was: why are you so important that you need a house cleaner - do all of it! Well, we have been several months now without the house cleaner. My wife still isn't 100% happy with the state of the house, but I am working on it. The other week, I made a real push to scrub the floors and do a number of other chores on one of my days at home, and she really appreciated it. I felt over the moon! I was wondering if this class could be opened to boys as well? I think the sooner boys learn these things, the easier their relationships will be. Currently, to say a man’s place is in the home would be either nonsensical or a put down. But, I can see men who have been through this training taking deep pleasure and satisfaction in homemaking. 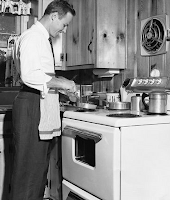 We will be a long way toward a better society when men can say with pride that their place in life is homemaking. As Nancy has said, that will free up women from doing menial work to come into their own as heads of household, leaders, and decision-makers. But, there is an added bonus for women and men. A man who has been through this training has suddenly become much more marriageable, more attractive as a helpmate to an ambitious woman. I wonder if dennis could comment on whether he and other men who have been through the training have made this transformation and how that has worked in their lives. I have to admit- as much as I want an FLR, I tend to slack off in my housework without adequate supervision and correction. A class like this would be just the thing! It might also help me learn to do laundry to my wife's satisfaction. She currently only delegates part of the laundry to me, because she doesn't think I can do it well enough to suit her. How I'd love to be able to please her by doing it exactly right! Last- wow, the expenses that come from this, and all on borrowed money! I can see why it took Dennis so long to pay back! But I'm sure that helps him appreciate it all teh more. If any the first of the two ingredients is missing it's vanilla. If the second is, it's either abusive or not worth pursuing. That's my honest opinion, and I say it with respect to the post. I hope nobody minds. I belong to a Cougar who does not hesitate to apply a firm hand to my behind. It enhances the lifestyle. I second that. A cougar who spanks. And who places her finger on my lips to shut me up from time to time when she thinks I should only speak when spoken to. And who thinks I'm sweet. And brings me flowers. And ties me up. And collars me and leashes me. And orders for me at restaurants. Yep, that kind. Actually Alex, I am not sure if She has ever tied me up. If She wants me in a position She simply orders me to assume it and I have to stay that way until She orders me to move again. She HAS done all the rest of it. I do all the laundry and the other Women in our complex compliment Her on how well trained I am. She handles all our contacts with local business and particularly local businessWOMEN have commented on how She 'wears the pants in the family'. Every year about this time our condo has its members meeting and She goes and represents our unit and casts our vote. She is the primary on all our financial accounts. Great Posts Dennis. I've been serving my Goddess for 7 years now. She is the sole earner and i'm her full time slave. She and her girlfriend have taught me all the housework. Recently my Goddess has got a scholarship for a Phd in a prestigious London Institution. I've been saving some money with her permission and begging her to allow me to buy PS4. But now i think i should beg my Goddess to let me join a course for a Nail Technician, since she'll be busy with her degree and the least i can do is to serve her better. You are certainly entitled to your opinion but charging fees for course participation isn't about 'financial slavery'; rather, it's about our having only serious gentlemen in the classes. It's the best way to control enrollment and ensure a good program. And one doesn't have to have any money to participate in the course since a applicant who is recommended and has good feminist and/or FLR credentials can get a 'scholarship' with no fees involved. As for 'financial slavery' as you call it, working for the benefit of a woman or women is a satisfying aspect of FLR. And I say 'women' because course fees, with exception of gratuities, benefit women's causes and organizations. First, i and other men in an FLR take ownership of housework and we feel it's a part of our roles and responsibilities. Nothing was needed to change that. i take pride in doing whatever my wife, her mother, or other female authority figures in my life tell me to do. Period! And i have to say that i take great pride in my homemaking and in what our home looks like. In future posts you'll see that - just as Women have in the past - men are taking an interest in skills and crafts that will help them beautify and enhance their homes. There are more men shopping at crafts stores these days and more men selecting window treatments than ever before. A woman i know who works at a major retailer in their household department says she can never assume who the customer is based on gender and that more of her customers are men! Our periodic men's nights out often feature crafts, decorating, and so on, that used to be associated with women. For example, we had a session on window treatments and another on flower arranging. Now, as for a transformation due to Housekeeping 101, well, there hasn't been a transformation in attitudes because men enter the training WANTING to improve their domestic skills. Where the transformation comes in is having better skills that allow a man to do a better job, have more confidence, and thus meet his Wife's high standards. It's really about confidence and that's why we have the practicum; men get to go out and practice what they've learned and receive appropriate compliments and critique from their Woman host and instructor. They take this into their own homes, improve, and please their Wives. I'm not too sure that saying a man's place is in the home is a put down as you say either. There is an increasing number of men who are homemakers and love the role. It's not a universal thing but we know many Women and couples who proudly proclaim that he's a homemaker. It's as though you expect that a professional Woman would consider it a put down to be called 'boss' or 'manager' - She doesn't, it's Her new role. 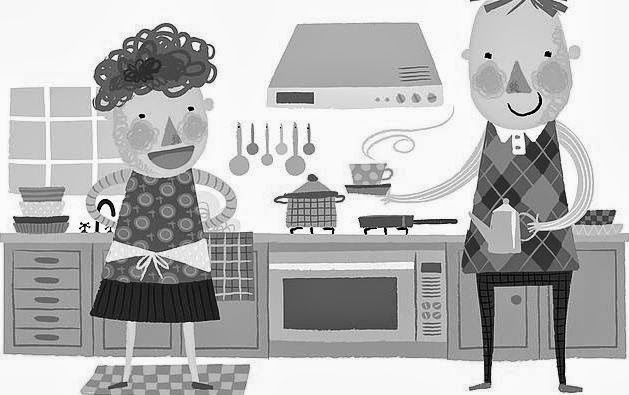 Same for men, homemaking is an emerging new and appropriate role for us. I am up late, just waiting for a load of laundry to finish drying, and decided to catch up on your blog. I re-read this entry because I found it so inspiring the first time. I am not surprised at all at the level of interest for housekeeping 101 by so many husbands. After all something worth doing is worth doing right, and housework above all is worth doing I am proud to say. I take great pride, and put all my efforts into keeping our home prim and proper. This leads me to my question. How long is the typical waiting list to begin the application, and vetting process for this (in my case) much needed course for men? The vacuuming component especially caught my interest, I also need some tips from a stern woman on how to properly scrub a toilet. I think $125.00 is quite a bargain for this especially since the practicum component only costs $25.00 for intruding on another persons time. My wife is willing to lend me the money, otherwise it would simply be out of my price range, despite being such an incredible bargain. DIVA'S LOVING LEADERSHIP: YES, DIVA!